'S e 21 an Dàmhair an 294mh latha dhen bhliadhna a rèir a' Mhìosachain Ghriogaraich (295mh ann am bliadhna-leum). Tha 71 latha air fhàgail gus deireadh na bliadhna. 1520 - Lorg Fernão de Magalhães Caolas Mhagellan, caolas eadar Ameireaga a Deas agus Tierra del Fuego. 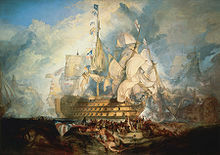 1805 - Bhuannaich an Cabhlach Rìoghail fo iar-àrd-mharaiche Horatio Nelson ann am Blàr Trafalgar an agaibh Napoleon Bonaparte. 1879 - Chaidh Lìg Nàiseanta Fearrann na h-Èireann a chuir air dòigh anns a’ bhaile Caisleán an Bharraigh. 1581 - Domenico Zampieri, peantair Eadailteach (ch. 1641). 1833 - Alfred Nobel; ceimigear, innleadair agus nuadhasair às an t-Suain. 1979 - Fernanda Erlanger Rodrigues, ann an Rio de Janeiro. Actair à Braisil. 1422 - Rìgh Teàrlach VI na Frainge (rug. 1368). 1944 - Hilma af Klint, ann an Danderyd. Neach-ealain às an t-Suain. Air a tharraing à "https://gd.wikipedia.org/w/index.php?title=21_an_Dàmhair&oldid=521814"
Chaidh an duilleag seo a dheasachadh 3 dhen t-Sultain 2016 aig 19:58 turas mu dheireadh.